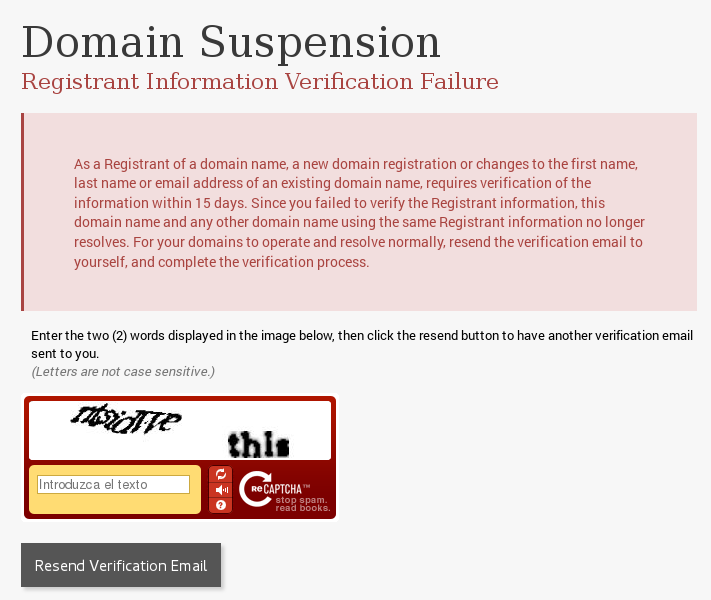 When you register a new domain or update any of your existing domains with new contact information, under the ICANN WDRP (Whois Data Reminder Policy) a verification email will be sent to the registrant email address you provide. Please note that it is very important that you respond to this verification email. If this email is not responded to within 15 days of being sent, the domain will be suspended and placed on hold (See Below), affecting all associated services. Although this is reversible, it may take up to 72 hours to re-activate your domain. These policies are mandated by ICANN and implemented directly by the registrar of record for the domain. We cannot intervene and hence cannot be held responsible for your failure to comply with these new ICANN requirements. What if I don't receive any validation emails?